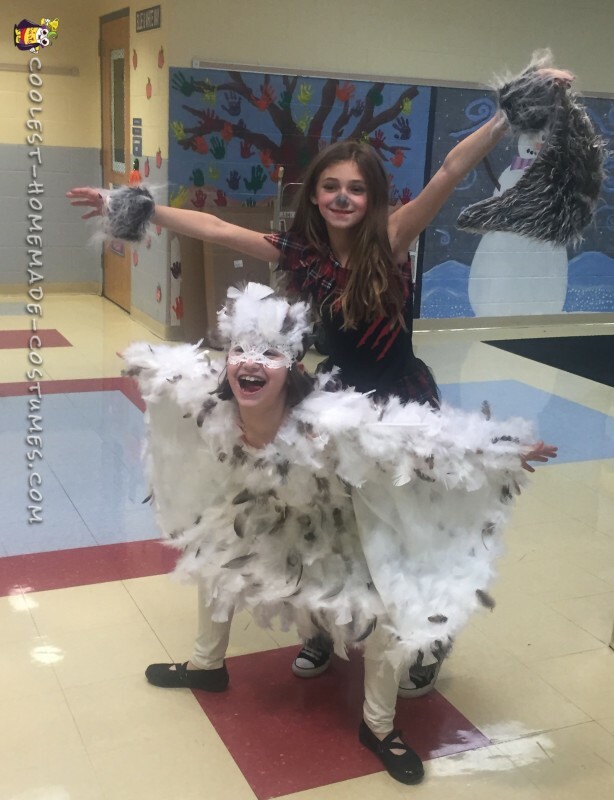 It all started when my animal crazy, nature loving daughter Molly saw a really fabulous, but extremely expensive owl costume. She insisted that she have this costume and would not settle for any other version I found; however, I was not spending $120 on a once worn Halloween costume. 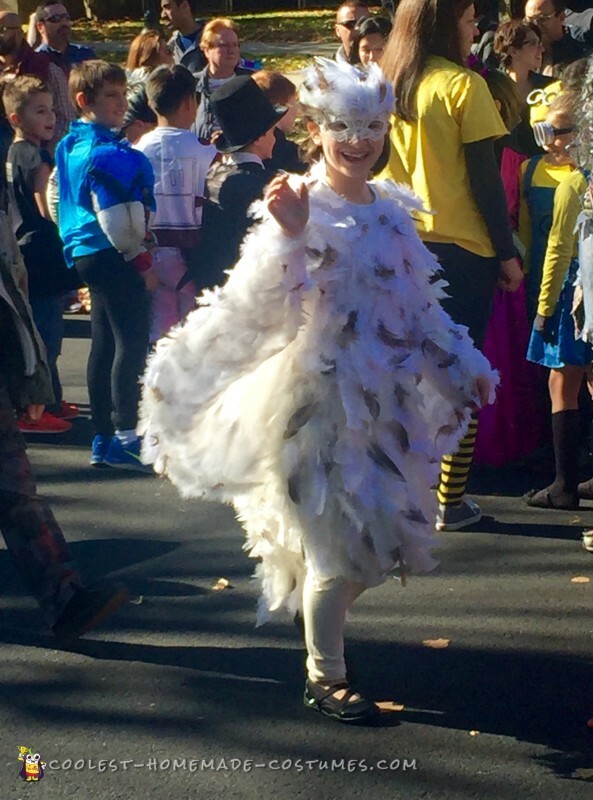 I offered to make her a Feathery Snowy Owl costume myself and I promised it would be even better than what she saw in the magazine. She reluctantly agreed and told me, “I’ll give you one shot mommy and it better be great or I’ll not wear it.” I told her if I made this she would either wear it or go out as herself because I was not buying that costume. 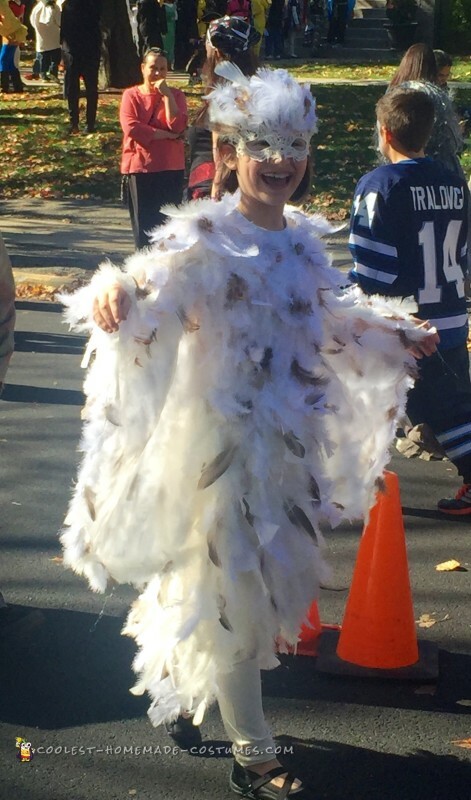 So after much back and forth on the base garment, colors, headwear, you name it she had input on it, we settled on a $10 ivory dress from Walmart, a $5 lace eye mask from a Halloween store… and a whole ton of cheap white, ivory, and brown feathers from a hobby store. We also picked up inexpensive sheer shimmery ivory fabric from the fabric store complete with use of coupon! Think wedding veil fabric. After we purchased all of the supplies I just went to town with my trusty glue gun. 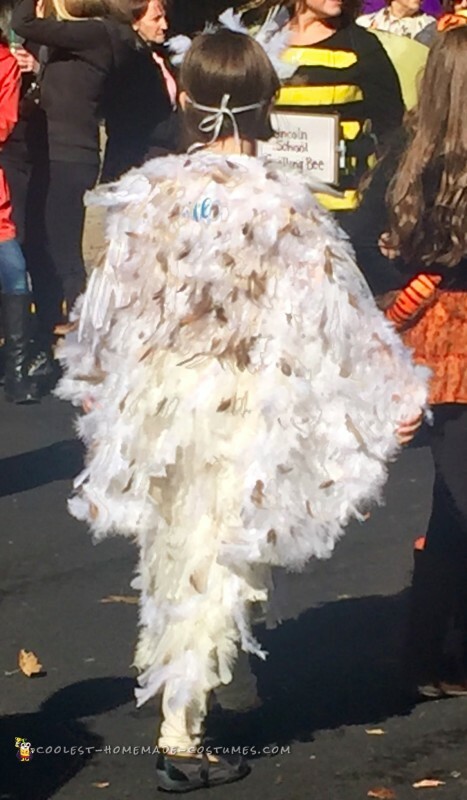 Layering feathers strategically all down the front and back of the dress till it was covered. Next I measured the sheer fabric from the center of her rock and down her arm to the wrist. This turned out to be exactly 1 1/2 yards for each arm so I just cut the doubled over fabric in half. I pinned along the length of her arm from pit to wrist but left the length of fabric below attached. Once I achieved this I just trimmed the fabric from the bottom at the knee outin an arc up to her wrist. So picture bat, angel, bird wing shape, whatever you prefer. I then just bast stitched along where I pinned by hand and did the same with the inner armhole to the cap sleeves that were already part of the main dress. Again I went to town covering the back of the wings entirely in feathers and on the front side I only covered the “sleeve” length area in feathers and around the outer “arc” edge of the wing leaving the front inner wing area to just be the shimmery fabric. Last but not least, I added feathers to the top of the lace mask for her face so that they came up over the top front of her head. She just wore a tank top and ivory leggings underneath that she already owned and Voila! This costume only took me about a week to make mixed with a lot of procrastination. The night before the Halloween social I was up glue-gunning feathers until 5:30 am but it was worth it to see my daughter once the costume was completed. She said it was even better than she imagined and it was the best, most favorite costume ever and thanked me with hugs and kisses. That pretty much cancelled out the lack of sleep and numbness in my glue gun burned pointer. All my supplies maybe totaled $35 Which made it even better. 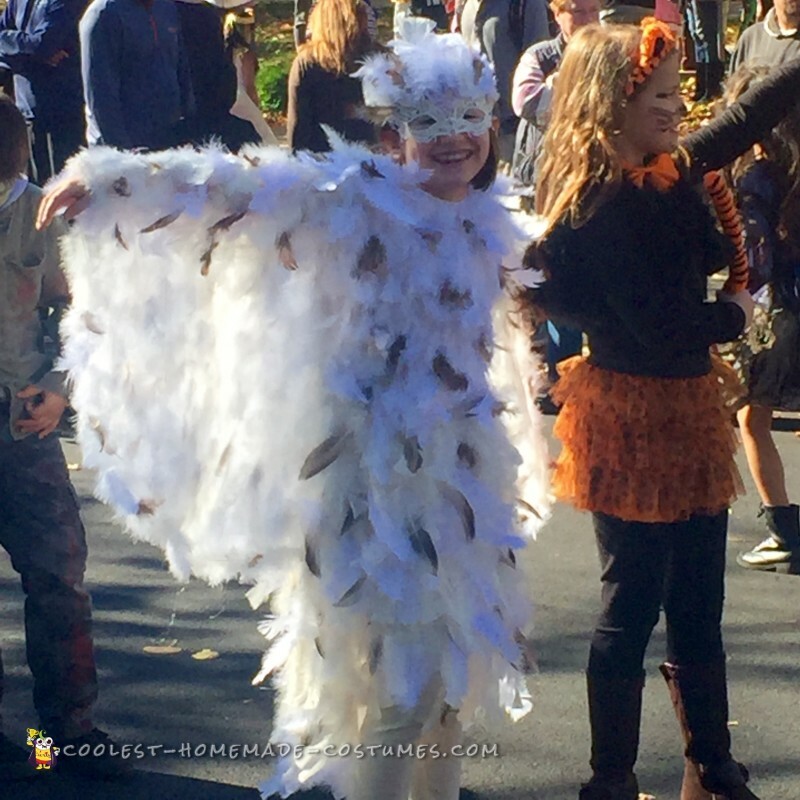 I had one beautiful happy snowy owl for Halloween 2015 and one we will never forget!